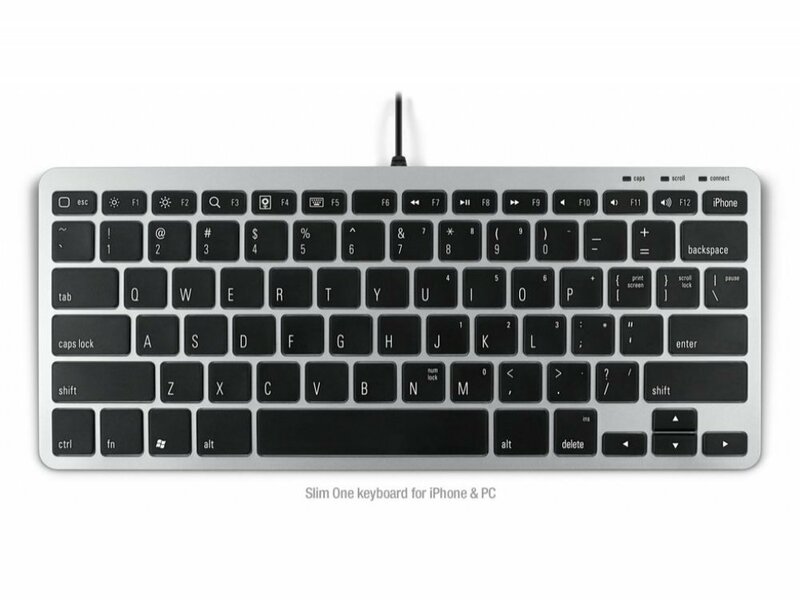 The Matias Slim One PC keyboard is a mini keyboard that connects to your PC via a USB cable and connects via it's built-in Bluetooth to your iPhone (or other Bluetooth compatible device). This enables you to type on your PC then type on your iPhone by pressing the iPhone key. Turbo charge your Texting, with the speed and comfort of a real keyboard. When you're at your desk, there's no faster way to type on your iPhone (or iPod touch, iPad, Android 3.0 phone, or tablet). The function keys control your iPhone's screen brightness, navigation, audio, and more. With one click, you can instantly switch back and forth between typing on your iPhone and your PC. It's like having two keyboards in one. Stylish and ultra-thin, the Slim One Keyboard looks gorgeous on your desk. It's also perfect in tight spaces, where you may not have enough room for a big keyboard. The MiniRizer lifts and tilts your iPhone for easier viewing and tapping. You have 3 angles to choose from: 15�, 25�, or 50�. Non-slip rubber feet keep it from sliding around on your desk. If you're left handed, you can move the stand to the left side of the keyboard. If you're used to controlling your iPhone with your left hand, this feels much more natural. The function keys provide all the standard Mac media controls, including volume, screen brightness, iTunes track selection, and more. Also connects to other devices. We designed the keyboard to connect wirelessly to your iPhone, but it's actually a standard Bluetooth connection, so it'll work with any device that supports Bluetooth keyboards. That includes... the iPod touch, iPad, Macs and PCs, Android 3.0+ smartphones and tablets, Samsung Galaxy Tab, BlackBerry PlayBook, and many more. The keyboard cable to your computer also powers the wireless connection to your iPhone, so you�ll never have to worry about batteries.